This flexible soaker hose gets water right where you want it: at the roots. Water seeps out of all sides of the fabric jacket and directly into the soil, for waste-free watering in garden beds and other tight spaces. Flat design makes it a breeze to roll up and store it for next season. Snake through rows of new seedlings or under mature plantings for efficient, deep watering season after season. 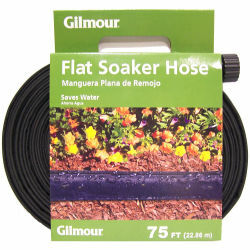 Create an easy DIY watering system by burying the hose under mulch. Hook it up to a timer and enjoy healthy, vibrant plants without all the watering work. Made of 100% environmentally-friendly recycled vinyl. Clog-resistant fabric cover for consistent soaking.